2015-2016 GMC Sierra 3500 HD PowerStep™ Black AMP Research (76154-01A). Plug N' Play System - includes OEM style illumination. For Gas ONLY. Made In USA. 5 Year Warranty. 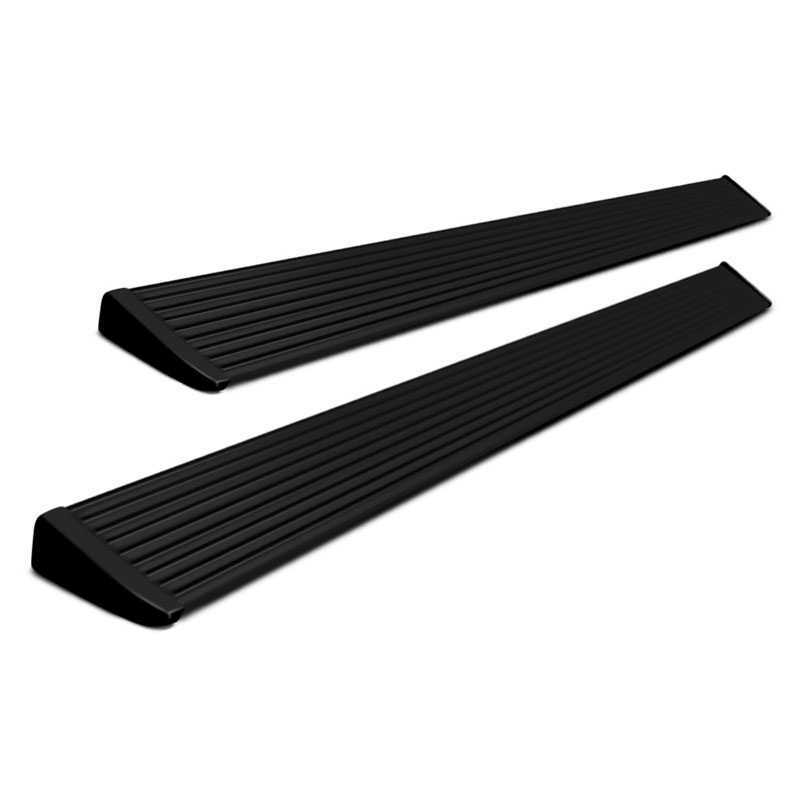 PowerStep Black Powder Coat Running Boards by AMP Research, 1 Pair. Without ODB Connector. Ford and GM have been equipping their new trucks at the factory with AMP Research PowerStep automatic retracting running boards for years, and so should you. High-grade aluminum construction with powder coat finish ensures strength and freedom from corrosion, plus OEM-quality hardware with durable seals ensures long-lasting, smooth operation. Some drilling required for power motor and LED light installation. 2004-2007 Ford F-250 Super Duty PowerStep XL Black AMP Research (77104-01A). Plug N' Play System - includes OEM style illumination. Made In USA. 5 Year Warranty. PowerStep XL Black Powder Coat Running Boards by AMP Research, 1 Pair. The board has been integrated into a custom rocker rail, creating a seamless look while providing a 3” lower stepping surface than the original PowerStep™ that makes accessing lifted trucks easier. With an integrated LED lighting system and available stainless-steel trim accent strips, the PowerStep XL™ is clearly the quality choice. High-grade aluminum construction with powder coat finish ensures strength and freedom from corrosion, plus OEM-quality hardware with durable seals ensures long-lasting, smooth operation. Invented, engineered and built in America, AMP Research PowerStep XL™, an automatic, electric-powered running boards are the real deal. 2004-2007 Ford F-350 Super Duty PowerStep XL Black AMP Research (77104-01A). Plug N' Play System - includes OEM style illumination. Made In USA. 5 Year Warranty. PowerStep XL Black Powder Coat Running Boards by AMP Research, 1 Pair. The board has been integrated into a custom rocker rail, creating a seamless look while providing a 3” lower stepping surface than the original PowerStep™ that makes accessing lifted trucks easier. With an integrated LED lighting system and available stainless-steel trim accent strips, the PowerStep XL™ is clearly the quality choice. High-grade aluminum construction with powder coat finish ensures strength and freedom from corrosion, plus OEM-quality hardware with durable seals ensures long-lasting, smooth operation. Invented, engineered and built in America, AMP Research PowerStep XL™, an automatic, electric-powered running boards are the real deal. 2004-2007 Ford F-450 Super Duty PowerStep XL Black AMP Research (77104-01A). Plug N' Play System - includes OEM style illumination. Made In USA. 5 Year Warranty. PowerStep XL Black Powder Coat Running Boards by AMP Research, 1 Pair. The board has been integrated into a custom rocker rail, creating a seamless look while providing a 3” lower stepping surface than the original PowerStep™ that makes accessing lifted trucks easier. With an integrated LED lighting system and available stainless-steel trim accent strips, the PowerStep XL™ is clearly the quality choice. High-grade aluminum construction with powder coat finish ensures strength and freedom from corrosion, plus OEM-quality hardware with durable seals ensures long-lasting, smooth operation. Invented, engineered and built in America, AMP Research PowerStep XL™, an automatic, electric-powered running boards are the real deal. 2004-2008 Ford F-150 PowerStep XL Black AMP Research (77105-01A). Non Plug N' Play System - Includes OEM style illumination. Regular & SuperCab requires minor cutting. Made In USA. 5 Year Warranty. The new PowerStep XL offers a 3" lower stepping surface than the original PowerStep and makes accessing your lifted vehicle easier. 2007-2013 Chevrolet Silverado 1500 PowerStep XL Black AMP Research (77126-01A). Non Plug N' Play System - Includes OEM style illumination. Made In USA. 5 Year Warranty. The new PowerStep XL offers a 3" lower stepping surface than the original PowerStep and makes accessing your lifted vehicle easier. 2007-2014 GMC Sierra 2500 HD PowerStep XL Black AMP Research (77126-01A). Non Plug N' Play System - Includes OEM style illumination. Excludes 2011-2014 Diesel. Made In USA. 5 Year Warranty. The new PowerStep XL offers a 3" lower stepping surface than the original PowerStep and makes accessing your lifted vehicle easier. 2007-2014 GMC Sierra 3500 HD PowerStep XL Black AMP Research (77126-01A). Non Plug N' Play System - Includes OEM style illumination. Excludes 2011-2014 Diesel. Made In USA. 5 Year Warranty. The new PowerStep XL offers a 3" lower stepping surface than the original PowerStep and makes accessing your lifted vehicle easier. 2008-2016 Ford F-250 Super Duty PowerStep XL Black AMP Research (77134-01A). Plug N' Play System - includes OEM style illumination. F-250/350/450 Crew Cab, 2008-2010 / 2013-2015. Does not currently work on 2011-2012. Made In USA. 5 Year Warranty. The new PowerStep XL offers a 3" lower stepping surface than the original PowerStep and makes accessing your lifted vehicle easier. 2008-2016 Ford F-350 Super Duty PowerStep XL Black AMP Research (77134-01A). Plug N' Play System - includes OEM style illumination. F-250/350/450 Crew Cab, 2008-2010 / 2013-2015. Does not currently work on 2011-2012. Made In USA. 5 Year Warranty. The new PowerStep XL offers a 3" lower stepping surface than the original PowerStep and makes accessing your lifted vehicle easier. 2008-2016 Ford F-450 Super Duty PowerStep XL Black AMP Research (77134-01A). Plug N' Play System - includes OEM style illumination. F-250/350/450 Crew Cab, 2008-2010 / 2013-2015. Does not currently work on 2011-2012. Made In USA. 5 Year Warranty. The new PowerStep XL offers a 3" lower stepping surface than the original PowerStep and makes accessing your lifted vehicle easier. 2013-2016 Dodge Ram 1500 PowerStep XL Black AMP Research (77138-01A). Plug N' Play System - includes OEM style illumination. Made In USA. 5 Year Warranty. The new PowerStep XL offers a 3" lower stepping surface than the original PowerStep and makes accessing your lifted vehicle easier. 2009-2014 Ford F-150 PowerStep XL Black AMP Research (77141-01A). Plug N' Play System - includes OEM style illumination. Made In USA. 5 Year Warranty. The new PowerStep XL offers a 3" lower stepping surface than the original PowerStep and makes accessing your lifted vehicle easier. 2013-2016 Dodge Ram 1500 PowerStep XL Black AMP Research (77148-01A). Plug N' Play System - includes OEM style illumination. Made In USA. 5 Year Warranty. The new PowerStep XL offers a 3" lower stepping surface than the original PowerStep and makes accessing your lifted vehicle easier. 2013-2016 Dodge Ram 2500 PowerStep XL Black AMP Research (77148-01A). Plug N' Play System - includes OEM style illumination. Made In USA. 5 Year Warranty. The new PowerStep XL offers a 3" lower stepping surface than the original PowerStep and makes accessing your lifted vehicle easier. 2013-2016 Dodge Ram 3500 PowerStep XL Black AMP Research (77148-01A). Plug N' Play System - includes OEM style illumination. Made In USA. 5 Year Warranty. The new PowerStep XL offers a 3" lower stepping surface than the original PowerStep and makes accessing your lifted vehicle easier. 2009-2012 Dodge Ram 1500 PowerStep XL Black AMP Research (77158-01A). Non Plug N' Play System - Includes OEM style illumination. Made In USA. 5 Year Warranty. The new PowerStep XL offers a 3" lower stepping surface than the original PowerStep and makes accessing your lifted vehicle easier. 2010-2012 Dodge Ram 2500 PowerStep XL Black AMP Research (77158-01A). Non Plug N' Play System - Includes OEM style illumination. Made In USA. 5 Year Warranty. The new PowerStep XL offers a 3" lower stepping surface than the original PowerStep and makes accessing your lifted vehicle easier. 2010-2012 Dodge Ram 3500 PowerStep XL Black AMP Research (77158-01A). Non Plug N' Play System - Includes OEM style illumination. Made In USA. 5 Year Warranty. The new PowerStep XL offers a 3" lower stepping surface than the original PowerStep and makes accessing your lifted vehicle easier. 2010-2012 Dodge Ram 1500 PowerStep XL Black AMP Research (77168-01A). Non Plug N' Play System - Includes OEM style illumination. Made In USA. 5 Year Warranty. The new PowerStep XL offers a 3" lower stepping surface than the original PowerStep and makes accessing your lifted vehicle easier.